I’ve got some new readers! I can’t tell you about all of those times I plugged the corporate servers into “The Clapper”, causing severe mental anguish to the entire organization. And for sure I can’t talk about those times when I went to a whole zoo of cubicle farms, and forwarded everyone’s phone to the next one. Some of you have been asking, so I’ve decided to tell you: saw the doc yesterday and, after a whole series of tests and interviews and after injecting his practice with a whole raft of money, he advised me that yes indeed – I have ADHD. He said “no. I don’t think so”. We shook hands. He sort of crushed mine. I tried to keep calm, knowing the pain would end soon. No tears, not even one. And I didn’t grimace. I’m pretty sure my ears popped though. Glad that’s over with. I’ve got stuff to do now. And long-lost plans to resurrect and get going with. The future is frigging *bright*. Did you see the harvest moon last night? Awesome, wasn’t it? Pssst- *Sweeney will throw the rock under the bushel tomorrow at noon. * wink wink. ut oh. My brain does that all the time. It wanders off on it’s own even though I AM interested in what is being said. I think that’s just my scatter-brained-ness though. The news came out quite by accident. I was on a phone call with them and happened to mention that I never use my real name on the internet, even on Facebook. One of them said “oh I’ll bet I know what you use. 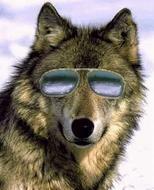 It’s wolfshades isn’t it?” And with that, the cat was out of the bag. And screeching like a banshee. I normally don’t say anything here that I wouldn’t say at work. But if the day comes when I find myself censoring too much, then changes will have to be made. Ugh. Hope that never happens. It took a bit of effort to set this all up. Ha. Not that easily, I think. Unless my book takes off. We’ll see. I’m kind of aspiring to be Hank Moody. So far, I’ve got the lost boy look, and the sunglasses. Just need to buy myself a Porche, knock out one of its headlights, write a few books, bed the dean’s wife, and I’m there. Oh and move to L.A. Can’t forget that. H-I-L-A-R-I-O-U-S! Oh my goodness, that had me laughing so hard Wolfie! 2) Can you or Suz or Chickee please send me the code breaker so I’m in the loop? 3) You can still sell the drugs — just stop calling it Heroin and instead call is Viagra or Prozac. We’ll all know what you mean! 4) Now that you have ADHD, now what? Uhm…. how does this work for me? (it’s always about me, see? Hee!). Ahhh the code… wellllll… I could tell ya but, you know, the, um. work force might be reading. BTW hi =) I’m Chickee. Nice to meet you Carmen. Ha! Chickee you are too funny! A pleasure to meet you for sure! 4) Now that it’s confirmed that I have ADHD….um….well…uh…..I don’t have to make excuses for wanting to play with the shiny coloured balls in my mind? *grin* Seriously – I’ve been wanting to do a few things for a while but kept getting distracted. (We’re talking years here). Now that the diagnosis is official, I can take the appropriate steps to get my house in order and get some of these things done to completion. Starting with my book. It’s a Big Deal. I’ve spent way too many months and years getting enthusiastic about this project or the other, only to drop it part way through. For most of my life, I thought I was lazy or something. I’m not. Just way too easily distracted. And the funny thing is: it’s not a decision point type of deal. It’s a brain mechanics deal – which the doctor described quite well. If I can find the right analogy here….it’s like someone having a broken finger, which makes it tough to type. So they have to find ways to get around the broken finger in order to get the job done. This is like that. I’m happy about the diagnosis. But I doubt I”ll be writing about it much more. It’s not like it’s the central theme to my existence or anything. Just something I needed to know. I didn’t think about having confirmation of a diagnosis — of course that makes complete sense! My apologies for being….an airhead! Of course. Well, then, congrats (?) if that’s the right thing to say and I’m happy that you can now move onward and upward..or whatever that saying is! Oh I bet it’s nice to get the actual confirmation about the ADHD, isn’t it? No more jumping through hoops with all the doctors or anything……although since you have ADHD jumping through some hoops may be something you’d enjoy from time to time…. Work mates reading your blog now, eh? Well that sounds like it should take some of the fun out of it, but with you doing the writing I’m sure it will just inject a whole new level of fun into things. I’m not worried at all…….well, okay, maybe just a little. Must admit: I’m pretty jazzed about finally getting that diagnosis. It was a long time coming. Now it’s time to get down to work and do something about it. Yes, I saw the harvest moon. Actually, I am camped out in the woods in a very remote area for the next month and the moon is incredible, as are the howling coyotes! Sounds like you guys got the perfect spot. I think those of us living in big cities miss out on a heck of a lot. Like seeing a sky full of stars, for example. Did you know – there’s a place here in Ontario that has a spectacular view. What’s more, the local townships know it, and they have built some bylaws with respect to lighting. All lighting must have covers so that the light points strictly downward. No “light pollution” allowed, in other words. That way, the residents and tourists can more readily appreciate the night sky. Oh, no! Life is over as we know it! What now? LMAO. You know – you work hard to keep what you do here separate from what you do at work, and then this happens. Life’s just not fair. Now I have to fire those guys. And they were so good at what they do, too. Yes, I do know you. Sorry for the belated response. I only sit down at this machine occasionally. How amazing you picked that up. I recognized your blog photo immediately and I’m at a loss as to where I met you, but I have. I was in the TO music industry for several years. We likely have a number of friends/acquaintances in common. Fascinating. Still drawing a blank, as I only know one guy named Dave – who used to live in Oshawa. I’ve been in the acting community in Toronto (and especially in improv comedy) but never on the music side of things. I’m wondering if maybe there’s a doppleganger of me out there. I think you may have thought I once stayed at the Gladstone but I didn’t – had to go look it up to realize it’s a hotel here in town. Don’t know. Interesting, yes! At the time I was in the media biz in TO doing voice-over recordings with John Candy and Rick/Dave Moranis and most of the other SCTV crowd, with the spookiest celebrity ever, being Jack Palance. ( whew! ). You’re too young to have been a part of that scene ( unless you’ve digitally messed with your photo ) but I did have a number of friends/associates who were younger and your face popped out as recognizable. Does Paul Irvine ring a bell? Maybe you’re right and you do have a doppelganger out there somewhere, but the familiarity I associate with your image ( as per your site ) is uncanny. I recognize all of the other names as performers that I greatly admired but never met. Paul Irvine though? No. Never heard of him. No digital enhancement. That was taken from a series of acting portfolio shots from 2007. Wow. What’s even more amazing: we came from the same town. What are the chances? Clearly the place to come for a grin. Thanks!! !